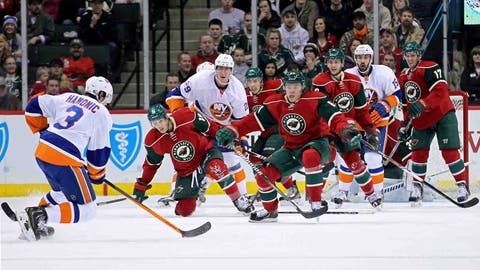 Minnesota Wild forward Mikael Granlund (64), forward Stephane Veilleux (19), defenseman Marco Scandella (6) and forward Torrey Mitchell (17) defend New York Islanders defenseman Travis Hamonic (3) during the second period. ST. PAUL, Minn. (AP) — The freefalling Minnesota Wild left their coach speechless on Sunday night. It wasn’t for a good reason. Kyle Okposo scored twice midway through the third period, and the New York Islanders overcame a three-goal deficit to beat the Wild 5-4 on Sunday night. Tavares rejoined the lineup one night after sitting out a home game against New Jersey because of an undisclosed lower-body injury. Ryan Suter, Jonas Brodin, Nino Niederreiter and Justin Fontaine had goals for the Wild, who have lost five straight and eight of 11. "It was there for us. That’s the disturbing part," Wild coach Mike Yeo said. "It’s hard to find the words for this because this is beyond disturbing right now. "We have to find a way to win that game. You’re up 3-0 and you’re at home. There’s no excuses." Coming off a winless four-game road trip in which they were outscored 19-8, the Wild fell to 15-4-2 at home. They had won 10 of 12 there and 14 of 17. Minnesota has home games during the upcoming week against St. Louis, Buffalo and Washington. At the season’s halfway point, Minnesota is tied for ninth place in the Western Conference with Dallas. Four of their next six games are against top-eight teams in the conference. "You just need to win. 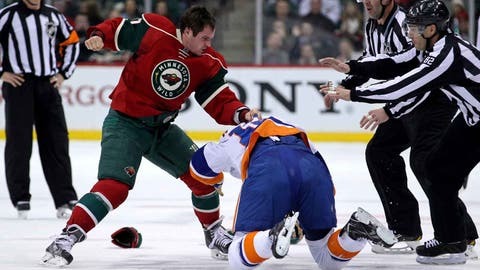 That’s the only way you come out of this," Wild captain Mikko Koivu said. "The only way you can win in this league is to play a good 60-minute game. We’re going to analyze it (Monday) and find a way." The Islanders didn’t play a complete game, either, but they were good enough. "We just kept chipping away and kept chipping away," Okposo said. "We were down 3-0, and kind of regrouped. We decided to go after them and start moving our feet. "For the first 22 minutes we weren’t doing that, so we decided to get pucks deep and go to the net." Okposo’s second goal capped a wild 2-minute span in which the Islanders took the lead, lost it, and regained it. Okposo, who played 1 1-2 seasons at the University of Minnesota, scored the winner with 5:48 to play when he raced in from the left wall and put in a rebound after Thomas Vanek was stopped by Josh Harding. With the Islanders trailing 3-0 midway through the second period, Tavares took a shot from the right edge of the crease that hit Koivu’s skate. The New York captain reached in and poked the puck across the line. "We’ve had our struggles, and they’re a good hockey team, they’re going to get through it," said Islanders coach Jack Capuano, whose team lost 10 straight from Nov. 19 to Dec. 9. "We didn’t talk anything about what they’ve done or their record. We just wanted to keep applying the pressure to them." "The first half of the game I thought we looked great, and then the execution the second half of the game," Yeo said. "There’s a lot that’s between the ears right now that we have to fix." Notes: New York was missing forwards Michael Grabner (illness) and Josh Bailey (upper-body). Each is considered day-to-day. . . . Suter played 33 minutes, 14 seconds, the sixth time in eight games he has exceeded the 30-minute mark. . . . The Islanders are 12-4-2 when they score at least three goals and are 0-17-5 when they don’t. . . . Minnesota welcomed the 10-millionth fan to watch the team at the Xcel Energy Center.